"One goes out, they ALL go out!!!" That's a common stressful battle cry during the holidays right? I mean, do you like trying to figure out which one of the hundreds of bulbs in the string is the culprit? No I didn't think so. So... if you hate it so much, why don't you do something about it? Behold the LightKeeper Pro. 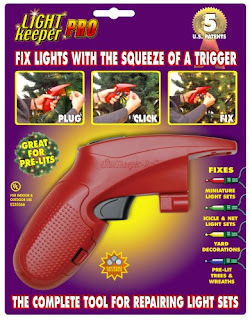 This affordable little gadget allows you to quickly and easily locate burned out bulbs in a series string of lights. How you asked? Read on! This nifty little device is available for under $20! For a list of retailers and more info on the product, head on over to the company website.